I had a particularly busy week last week. Busier than usual. I was teaching an online blogging class. I was live streaming office hours for my class in the evening. I was writing bios, articles and blogs. I was designing and sending out newsletters. I was meeting with clients and potential partners. I was attending Christmas parties. I was hosting company at my house. I was attending a soccer tournament for my son. I was Christmas shopping and sending out cards. I was driving to and from soccer and guitar practices. I was scolding my puppy for eating part of our living room rug. Three Four times. Oh, and did I mention my husband and I traded in both our cars for two new (to us) ones? I probably should have said “no” once or twice last week. But, you know what? I still managed to make it to the bus stop for my son at 3:30pm every day. I still managed to stop and watch Top Chef on Wednesday evening. No one burst into my office while I was streaming live on the internet for my blogging class. We had some great family time. I stopped myself a few times and reminded myself to breathe. And to be thankful for the opportunities that I had in front of me. It was exhausting and exhilarating. By the end of the weekend, I realized how trivial my week seemed in the grand scheme of it all. I don’t think I’ve ever been happier to see my son get off the school bus on Friday. I don’t think I’ve hugged my boys harder. It’s amazing how tragic events can change your perspective so quickly. If you need a little help restoring your faith in humanity, take a look at this. I promise it will make you smile and probably shed a tear. I can’t explain the events of last Friday at Sandy Hook Elementary School, but I hold faith that there is more good in the world than bad. Jenn recently posted..We&#8217;re not sure how this goes. Yup. I’m crying. So sweet. Michelle recently posted..Best Darn Beginners Class EVER! Seriously! We’ve got to remember the good, even in the face of all the bad that’s around us! That’s what I’m trying to do for my boys anyway. thedoseofreality recently posted..1…2…3—Quick, Everyone Look Happy! Seriously. It’s easy (and normal) to be angry and sad, but we have to remember to be hopeful. Thanks, Chris. I’m trying to avoid the media for now. There’s too much blaming going on. I feel like we need to focus on some good in memory of those precious lives lost. jen recently posted..Yesterday a madman.. Thanks, Jen. This post was started on Friday before I knew all the details of what happened. The ending, of course, changed after the weekend. With so many emotional reactions around me, I felt the need for something uplifting. Beautiful post. I agree with you- it’s important to hold onto the good, and not become overwhelmed by fear or sadness, despite the horror of this event. 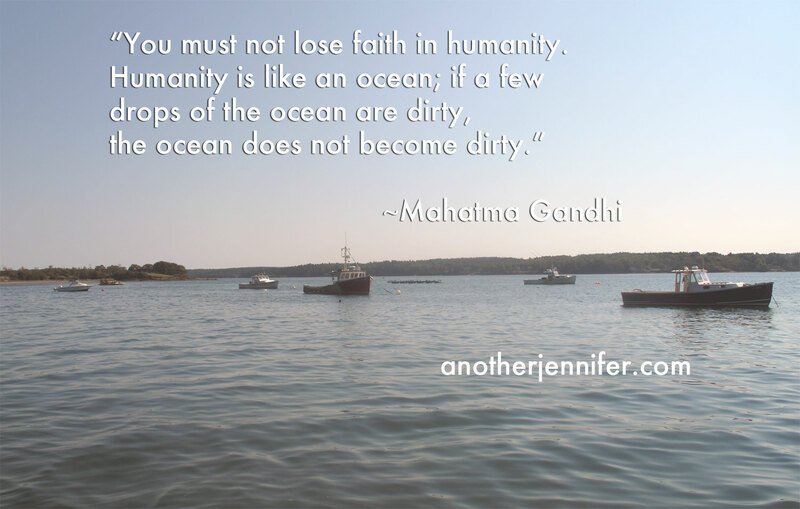 Love Gandhi’s quote! It’s the perfect quote, isn’t it? Thanks for stopping by! Perspective is a gift. It is unfortunately something that unfolds a lot of the time in light of someone else’s tragedy, however, it reminds me how lucky I really am – and how lucky I am to have my set of problems versus someone else’s! I feel the same way, Ilene! It’s true. What would we do without hope? Very inspirational! Thanks for posting!